The enthralling biography of the woman writer who helped end the slave trade, changed Britain’s upper classes, and taught a nation how to read. The history-changing reforms of Hannah More affected every level of 18th-Century British society through her keen intellect, literary achievements, collaborative spirit, strong Christian principles, and colorful personality. A woman without connections or status, More took the world of British letters by storm when she arrived in London from Bristol, becoming a best-selling author and acclaimed playwright and quickly befriending the author Samuel Johnson, the politician Horace Walpole, and the actor David Garrick. Yet she was also a leader in the Evangelical movement, using her cultural position and her pen to support the growth of education for the poor, the reform of morals and manners, and the abolition of Britain’s slave trade. Fierce Convictions weaves together world and personal history into a stirring story of life that intersected with Wesley and Whitefield’s Great Awakening, the rise and influence of Evangelicalism, and convulsive effects of the French Revolution. A woman of exceptional intellectual gifts and literary talent, Hannah More was above all a person whose faith compelled her both to engage her culture and to transform it. A book everyone should read, a life everyone should know, and one that many should emulate. I’m so glad I read this book. Hannah More- a marvelous writer and a courageous opponent of the slave trade- is now one of my special saints! 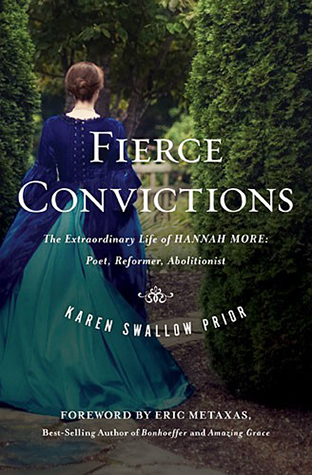 With careful research, balanced judgments, accessible prose, and unusual insight, Karen Swallow Prior’s biography shows clearly why Hannah More made such an important impact in her own age and also why her life can speak in significant ways to readers today. Hannah More deserves long-overdue recognition as one of the great moral reformers of her time. Karen Swallow Prior’s fascinating biography restores her to just that place, alongside John Newton and William Wilberforce. This compelling book is a must-read. Karen Swallow Prior is an extraordinary thinker, writer, and voice in the church today. I can’t wait to see how Hannah More’s story changes the current landscape of the church and raises up many with fierce convictions. Here is that rarity of a book: scholarship of impeccable rigor that’s also a compulsive page-turner. Reading Karen Swallow Prior feels like a privilege.